Cloud microphysical processes are explored by means of microscopy, light scattering and Raman microscopy on single droplets are stored for long periods of time under well controlled atmospheric conditions in home built levitation chambers. Single water droplets are created by a piezoelectric nozzle, charged by induction and injected into an electrodynamic balance, where they are stabilized and trapped by electric forces at well defined temperature, humidity and atmospheric composition. 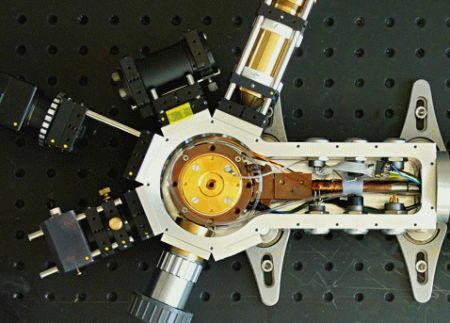 Their phase, size and index of refraction is monitored continuously by analyzing the light scattered from a monochromatic laser beam onto a CCD detector, while their chemical composition may be probed by Raman spectroscopy. Fast droplet processes may be analyzed by high speed video-microscopy.